A very simple and easy to do recipe. These spiced potatoes goes well with rice, breads or chapatis. You can also serve these potatoes as spicy starters during parties. Oil 2 tbsp for shallow frying as well as seasoning. Wash and clean the baby potatoes. Pressure cook these potatoes. Add salt while cooking them. Once cooked the potatoes should be soft and at the same time maintain its shape. Peel the skin when cooled down, prick them with fork or toothpick, shallow fry them in oil till golden brown and keep aside on paper napkin. Take care and see that the potatoes do not break. Take oil in another kadai. Add mustard seeds. Let it splutter, then add curry leaves. Sim the flame. Add hing, turmeric powder, chilli powder and sambhar powder one by one. Add fried potatoes, tamarind paste and fry them on low flame. Saute gently and see that the masala powder coats the baby potatoes. Add salt as per your preference. Mix and cook for another 2-3 minutes. Garnish with curry leaves. This goes well as side dish or spicy starters by itself. Serve it hot. 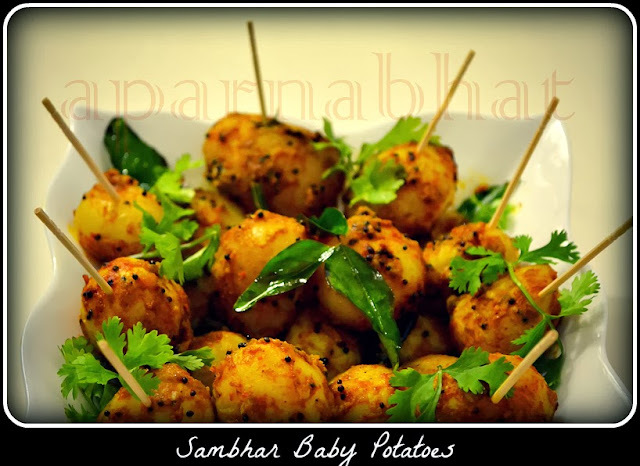 I thank my friend, Suphala Shenoy for sharing this yummy recipe. Note: While serving as starters, I garnished them with coriander leaves and served with tomato sauce.